At the cutting edge of machine tool engineering, this family of lathes encompasses all the advanced features and flexibility you would expect from a world-leading manufacturer. Kingsbury supplies the complete range of automatic, multi spindle turning machines from INDEX-Werke GMBH, perfect for series production of high precision parts. At the cutting edge of machine tool engineering, this family of lathes encompasses all the advanced features and flexibility you would expect from a world-leading manufacturer, such as separately driven spindles with C axis and polygon turning capabilities, self-optimised cutting speeds for reduced tool wear and chip production, driven tools in all spindle positions, and a Synchronised-spindle for back-working in conjunction with up to 6 tools. 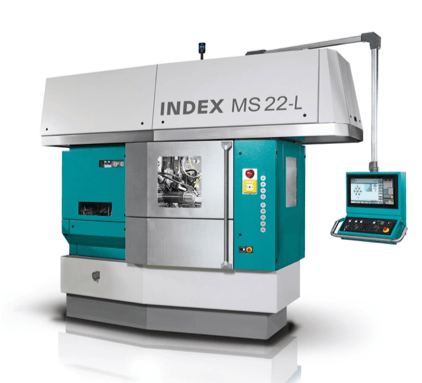 The modular approach employed by Index allows for huge flexibility in machine set-up, including the option to convert 6 or 8 spindle machines to double Indexing versions offering 2 parts per cycle. In 2012, turned parts subcontractor Auto Turned Products (ATP), a long-time user of cam-type multi-spindle autos and CNC single-spindle lathes, decided to evaluate CNC multi-spindle turn-milling. A German-built Index MS 32 six-spindle CNC auto of 32 mm bar capacity and with an opposed spindle for endworking was duly bought from UK agent, Kingsbury.